nice! when is ur birthday sailaja garu? This dish looks really tempting…I do make but never added any nut powders…sure to try!! Thank you for posting a nice recipe. I learnt a lot from your blog and impressed my family members and friends. 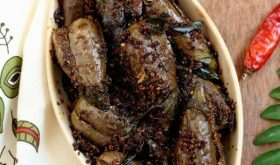 Could you please post recipes related to stuffed capsicum, beetroot and cabbage? Beautiful presentation Sailu, as usual. Looks colourful and attractive. looks yummy.will try on my hubby’s b’day.he loves dishes tried from your site. thanks. The quotes are from my desktop calender ‘Mottos for Success’ that is published by ‘The Family International’ each year. Looks tempting with a different flavour ! Good color and looks tempting, can’t wait to try these. Sailu, instead of peanut what can I use. Omit it and use just sesame seed powder. I have seen your reciepes quite a times whenevr i was searching for some details.. your presentation of things are good.. after looking at them I thought to give a try of my blog too.. before that would like to try your receipe and try to upload in my blog… Is that fine..
Sailu garu, what do you mean by sesame seeds and peanuts in telugu? Thank you in advance. 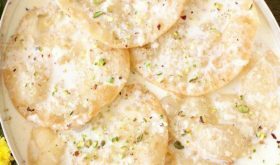 Hi Sailu garu… nice recipe. I have always tried capsicum with besan. This is a variation for me. I would definitely give it a try. I tried this recipe and it turned out really well! thank you.. Came out perfect and tasted awesome! Thanks for this recipe!! Just wanted to let you know actually what a service you are doing to the ‘kitchen challenged’ through your site :). The way you make the process simple by numbering the steps, the tempting photographs and of course the awesome results i get at the end of it all keep me addicted to your site! I rarely cooked before marriage and still cooking is more like a chemistry lab to me.Your site has been a real help. The capsicum tomato was so simple and is a total rocker! Just one small suggestion. 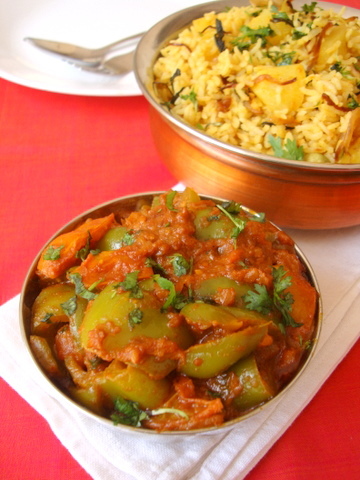 Whenever you post a non-veg dish, could you please include a veggie substitute as well. I am tempted to try many of your non-veg dishes. But often confused if my veggie substitute will work. Anyway, thanks for the excellent work! 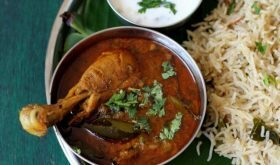 Thanks for posting such a great receipes..I tried this receipe on my wedding anniversary and curry was really superb!!! 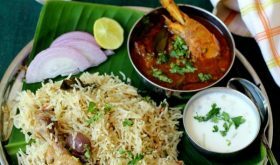 I don’t have any interest in cooking..after seeing your site iam very much addicted to kitchen and trying out receipes mentioned in your site..You are really great for sharing information. 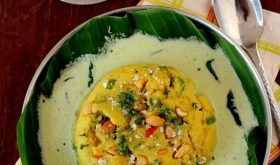 This is a very delicious recipe.Tried it and it goes well with Chapathi.this is HIT in my home. I have tried your recipe and it is superb.Thank u.
all these commens are sollu ! I wanna cook this recepie using only peanut pow. As we wont use seseme at our home. Is it goes well?? Your recipes help me make delicious dishes! I am so addicted to your site and I keep trying a new recipe almost every alternate day. Thanks a ton! I am into kitchen and my wife out of job. I am enjoying ur recipes so is my family. Recipe came out great! My husband fell in love with it! 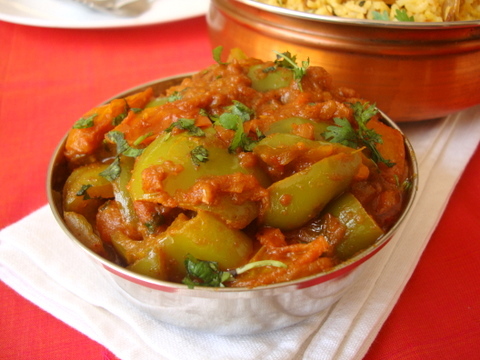 I tried your capsicum tomato curry, it turned out very well, very simple yet delicious recipe. Good one. I tried this curry and it came out very well. I prepared it as a side dish with Vegetable fried rice. I used red & yellow bell peppers along with green peppers. The sweet and hot taste blended very well. Had it with both roti as well as the Potato biryani. Was yum yum.